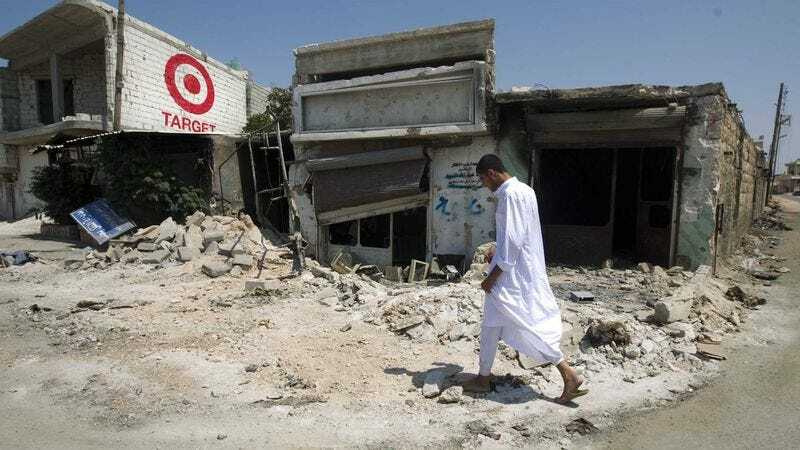 MINNEAPOLIS—Retail giant Target announced Monday that, due to a complete lack of public interest or attention in the conflict, the company is ending its sponsorship of the ongoing civil war in Syria. “Unfortunately there just haven’t been enough eyeballs on this brutal crisis in Syria, so we’re officially pulling the plug on our endorsement,” said CEO Gregg Steinhafel, adding that the two-year, $70 million sponsorship deal, which placed Target logos and advertisements on rebel tanks, Bashar al-Assad’s presidential palace, and rubble from bombings in Damascus and Aleppo, would cease immediately. “We thought the global exposure of the mass murders of more than 20,000 innocent civilians and protesters by the Syrian government would be the perfect opportunity to advertise our great deals on Bella kitchen appliances and our stunning new line of Target-exclusive Merona shirts for men and women. But no one really seems to be paying much attention to the civil war at all, so we can no longer justify the investment.” Steinhafel confirmed that, despite the end of the sponsorship deal, the winner of Target’s “Win a Dinner Date with al-Assad” raffle would still receive the prize.